Days two and three of the 2024 IOC Evaluation Commission visit to Los Angeles were as jam-packed for media as they were for the future Games selection team. 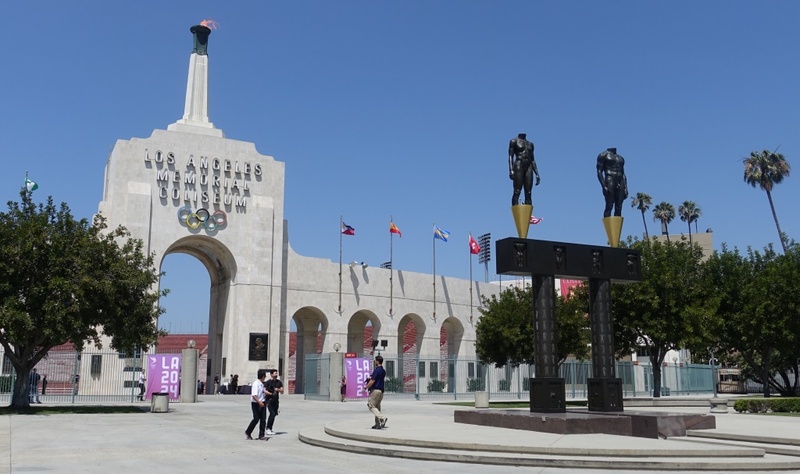 The combined LA2024 and U.S. Olympic Committee media relations crew treated attending reporters to a full Thursday of venue visits including two university campuses, a Metro station press conference and multiple photo opportunities or bid-centric press events. May 9 began early at Staples Center, where IOC members took turns shooting hoops on the LA Lakers' home court. 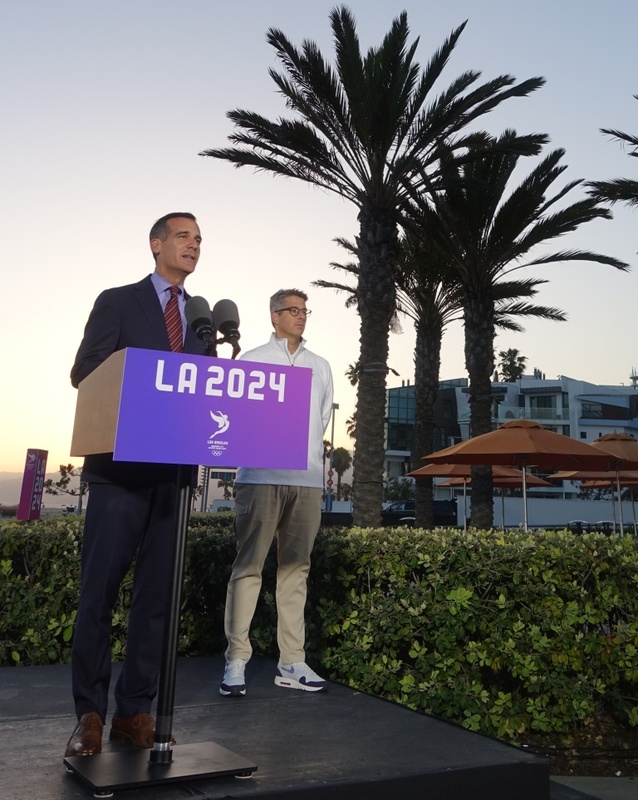 Los Angeles Mayor Eric Garcetti, LA2024 Chairman Casey Wasserman and IOC Member Anita DeFrantz also practiced layups and cheered when visiting delegates found "nothing but net" through informal basketball play. Then two groups of Evaluation Commission members embarked on site visits in separate corteges, with media site visits on a parallel track to the IOC tour experience. Stop one: The University of Southern California, home of the Trojans and the nation's No. 1 school in terms of total Olympians (451 since the early 1900's). Media heard from Olympic track champion and USC alum Allyson Felix before experiencing a walking tour of a soon-to-open modern dorms that would house the Olympic media village in 2024. We also toured USC's Annenberg School of Communication, which would house the 2024 Olympic Media Village operations center close to new dorms which reporters visited. A quick bus ride over to Los Angeles Memorial Coliseum lined up with the IOC's morning visit inside the stadium, which apparently included a foot race between Garcetti and at least one Olympic track champion from 1984. We learned later in the day that more than 50 Olympians met with the Evaluation Commission, with the first women's Olympic marathon champion Joan Benoit Samuelson sharing a tearful reunion with a fellow LA84 gold medalist Nawal El Moutawakel, who is now an IOC member (both women achieved remarkable "firsts" as female competitors on the same track). Brief sidebar: The coliseum photo opportunity marked my fourth visit to the venue, and not the first time the cauldron was aglow, but this was the first daytime and ignited flame combination and it was remarkable in that the morning sun and cloudless sky brightened the historic stadium's adobe-hued exterior. More walking ensued, this time past USC's historic and wonderfully fragrant rose garden (we did, in fact, stop to smell them). 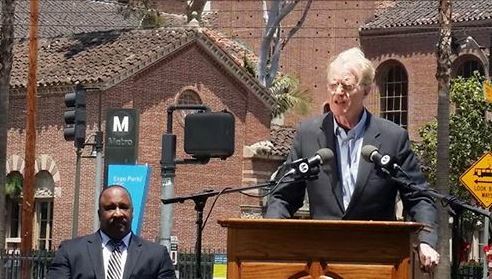 A few hundred meters later we were greeted by -- surprise -- local resident and longtime environmental champion Ed Begley, Jr., on site for an outdoor press conference to promote the fifth anniversary of the LA Metro Expo Line service between downtown Los Angeles and points west. Our entourage boarded buses to arrive at the University of California at Los Angeles in time for a superior campus dining experience. Several inquisitive undergrads asked me about what our group was doing on site -- our objective, to experience a sample of an afternoon in the potential future Olympic Village. 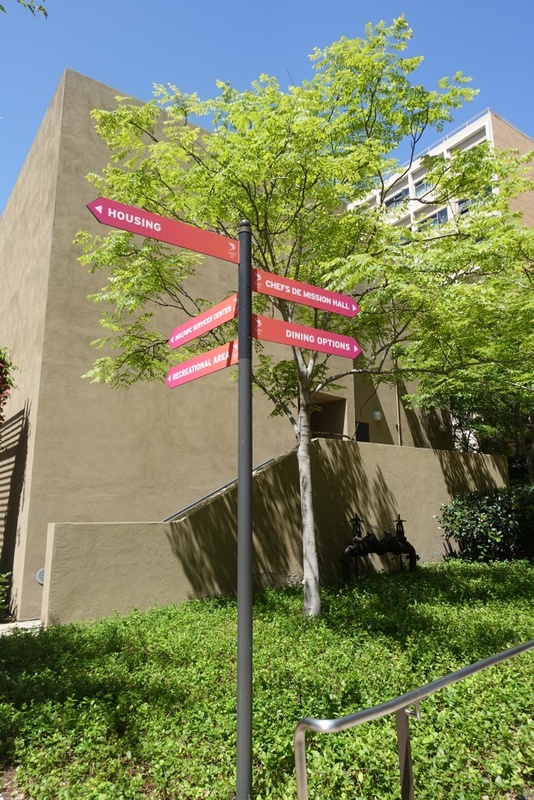 LA2024's proposal to house the athletes in existing or new dorms is a key differentiator for the bid, saving piles of money while harnessing a fantastic, well-developed and mature tree-filled campus atmosphere. Our hosts pointed out several residences build when the school hosted one of LA84's villages. We must have walked 5,000 steps on site, including peeks at student gyms, three student swimming pools, Pauley Pavilion (site of Mary Lou Retton's perfect score in 1984) and the school's sports hall of fame celebrating, among thousands of alumni athletes, the school's 420 Olympians. LA2024 has a strong asset in that the UCLA Olympic Village existed even before the '84 Games, and as announced just after the IOC visit the same day, another batch of several hundred rooms are planned for the campus. With slightly sore legs and definitely smarting feet, media departed for the beaches of Santa Monica for the IOC's and LA2024's Day Two media Q&A, this time framed by a perfect sunset and light ocean breeze. The purple and pink skyline over nearby Malibu and Santa Monica Mountains gave attendees a dreamy "Follow The Sun" moment. As an after-dinner sendoff from the press conference venue, the Annenberg Beach House, a troupe of six synchronized swimmers dove into a logo-ed swimming pool, reminding attendees of LA2024's fast-paced and precise timing executed consistently through the three-day Evaluation Commission process. The swimmers' smiles above the surface, all the while furiously kicking and positioning, may echo the hard work of LA2024's team to prepare and execute the key milestone in the IOC selection process. Friday morning brought just two press conferences, one each for the IOC and LA2024 officials, again at Staples Center. 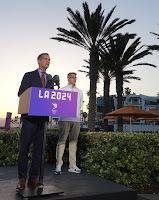 At the latter Q&A I asked Garcetti and Wasserman to expand on their professional relationship and friendship through the bid process since the IOC had nicknamed them the "1984 boys" who were youthful Angelinos during that summer's Olympiad. "We met in our 20's," said Garcetti, answering whether they knew each other as kids or teens. Garcetti went on to explain that his very first official action as LA's newly-elected mayor was to deliver a letter confirming his interest, support and passion for a bid. Now many months later, he confidently summed up the collective efforts of the combined LA2024/City of Los Angeles team. 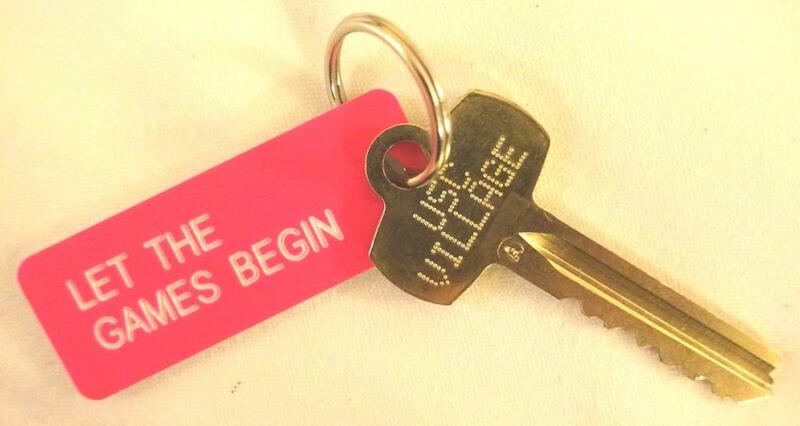 "We keep looking for a hole in this bid, and we can't find it," said Garcetti.